When Georgia won its second Top Business Climate ranking in 2014, it was just getting warmed up. It won a third in 2015, a fourth in 2016 and, in 2017, a fifth consecutive Site Selection Top Business Climate finish. Governor Nathan Deal is the only governor to have headed a state’s executive branch for five consecutive wins. The ranking is a blend of subjective and objective measures — 50 percent is based on a survey of corporate site selectors who indicate their top states, and 50 percent is based on an index of largely Conway Projects Database measures of where facilities are actually being sited (see the methodology). To underscore Georgia’s case for being a predictable and business-friendly capital investment destination, Georgia ranked the same or better than it did in all of Site Selection’s 2016 measures of state business climates. In other words, even at No. 1 last year for the fourth consecutive time, there was still room for improvement — and the Peach State did just that, sealing a fifth straight win. Like last year, the Southeast is the best-represented region in the top 10. Only Ohio and Indiana join that list from outside the region, and both are regulars near the top of Site Selection measures of state economic development success, including the Governors Cups each March. North Carolina, Texas, Ohio and Tennessee round out the top five, the same four as last year, with a minor shift in placement. More notable changes include Kentucky jumping from 14th place in 2016 to 8th this year, and Nevada rising from 21st place to a tie for 12th with Florida. Industries seeing significant job growth from this influx in investment include financial technology, logistics and distribution, automotive, digital media and food processing. “What’s behind five consecutive Top Business Climate rankings?” Site Selection asked Governor Nathan Deal at his State Capitol office in early October. Second, says the governor, timing has been on his side. One of the most important business-attraction ingredients is a qualified workforce. Is Georgia finished with the task of putting that in place? Not yet. These include truck drivers, welders, nurses and, more recently, film production staff. For those individuals who would attend Georgia technical schools, and more recently the Georgia Film Academy, for those degrees or certificates, the state will pay 100 percent of the tuition costs. “Perhaps even more important than that is getting children interested in going beyond high school from an educational standpoint,” says the governor. “We had a ‘move on when ready’ program when I came into office but not much attention had been paid to it. We thought we could do more with it, and we now have what’s called dual enrollment. That allows students in their last two years of high school to go to a college or university, take courses there and get credit for the high school graduation and credit in the higher institutions of learning toward a degree or certificate. Enrollment in these continues to grow rapidly every year. Good success stories are coming out of that. Young people who were bored in high school suddenly are put in an environment, especially in the technical college environment, where they can see the end result, and they can see a good job at the end of that. This will continue to be an important part — it not only solves the problem of acquiring skills, it also fills the workforce gap that we currently experience. On the occasion of previous Top Business Climate ranking wins, the governor has made a point of stressing Georgia’s fiscal soundness as a fact to take to the bank. In June, Gov. Deal announced Georgia again earned a rating of AAA, with a stable outlook, from each of the three main credit rating agencies — Moody’s, Fitch and Standard & Poor’s. Of the states that issue general obligation bonds, only nine currently meet this standard. This rating resulted in low interest rates during the sale of $1.39 billion in bonds, which includes $349 million of refunding bonds to refund previously issued bonds and achieve total debt service savings of $43.8 million. “The State of Georgia works diligently to maintain the coveted AAA rating, and we are one of only nine states to earn this distinction,” said the governor at the time. “By consistently earning top marks, we ensure our bonds remain highly sought after and provide the state flexibility to secure low interest rates for capital projects. Ultimately, this AAA bond rating reflects our fiscal responsibility and results in millions of dollars of savings for our taxpayers. “Rating agencies are very attentive to details,” the governor tells Site Selection. “To say we have a AAA rating by the three major rating agencies is not something we should take lightly. They are serious about it and their reputations are dependent on making sure they give the right ratings to the right states and local governments.” The chief benefit is the message it signals to capital investors — a message of fiscal stability and predictability with respect to incentives when they factor into projects. Governor Deal tells entertainment industry executives every year (at increasingly well attended events in Los Angeles) that Georgia can confidently make those tax credits available as long as its fiscal house remains in order. Other states have cut back on or eliminated film industry tax credits, because their budgets are in jeopardy. The film industry in fiscal year 2017 had an economic impact of $9.5 billion, and the 320 film and television productions shot in Georgia generated $2.7 billion in direct spending. “We were just told that we have now surpassed California and New York in major films, and are now the leading state in that industry,” the governor notes. Does Georgia have a shot at winning the contest to land Amazon’s HQ2 project? As this interview was conducted, metro areas around North America, including Atlanta, were finalizing their pitches for delivery to Amazon’s HQ1 in Seattle on or before October 19th. In the meantime, what’s important to more than a dozen corporate research offices that have opened in recent months and years at Atlanta’s Tech Square is access to Georgia Tech brainpower. The Midtown neighborhood adjacent to the Georgia Institute of Technology is bursting at the seams with new offices for the Siemens Data Analytics and Application Center, the Home Depot Technology Center, NCR Corporation’s new world headquarters, the Panasonic Innovation Center, Southern Company’s Energy Innovation Center and the ThyssenKrupp Research & Innovation Center, to name just a few. If there were such a thing as a safe bet for a spec building, if there’s still room for one, Tech Square would be the spot, and it would soon be leased. This is good news for Atlanta, but is Georgia’s business climate getting any credit? 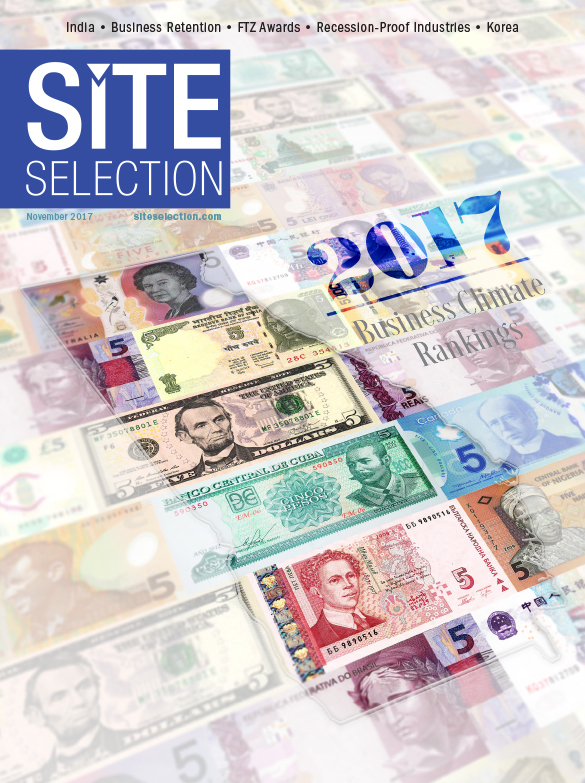 Fifty percent of the overall Business Climate Ranking is based on a survey of corporate site selectors who are asked to rank the states based on their recent experience of locating facilities in them. The other 50 percent is based on an index of seven criteria: performance in Site Selection’s annual Prosperity Cup ranking (formerly the Competitiveness Award); total Conway Projects Database-compliant facility locations and expansion projects in 2016; total projects in 2016 per capita; total 2017 projects year to date; total 2017 projects year to date per capita; state tax burdens on mature firms and on new firms according to this year’s Tax Foundation and KPMG Location Matters analysis.